I'm running out of time …. My how my days have changed over the last week or so. It's 7.30am I'm up, dressed, have been to Leamington and back to drop Oli at work and am now musing over an early morning cuppa. It's two days till my sister arrives for a week, Harry has no trousers or bow tie for his prom on Friday eve and is not going to be up any time soon for me to take him shopping. The house looks like a warehouse, Harry's room is indescribable and has to be spring cleaned from top to bottom before Annie arrives or one of them will be on the couch. I've got a lunch date with my lovely Aunt Loxie on Thursday for a good old catch up and we're hoping to call by and see my Aunt and Uncle as I'm missing their 60th Wedding Anniversary bash on Sunday. Andy's having a bit of a Birthday on Thursday too and ….. well I'm starting to get jumpy about how I'm going to get all I need to finished ready to teach over the weekend and then spend time with Annie. ….. I wish there were 48 hours in a day at the moment. Our pics today are of a lovely gift from Lyn, one of the Creative Spirits. 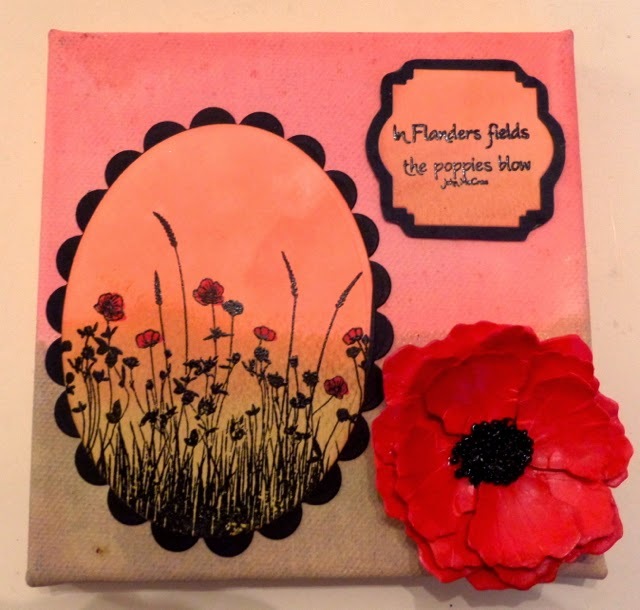 A very apt, beautifully altered canvas for this years World War 1 celebrations and remembrance. 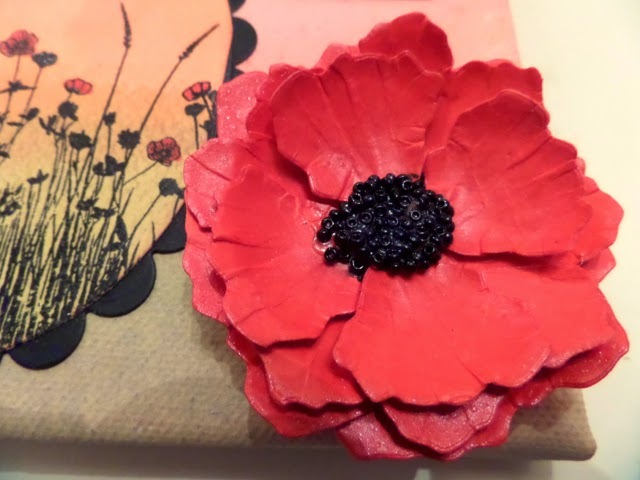 The background and sentiment are embossed and the large poppy was made using the Susan's Garden poppy die. Beautiful Lyn, thank you so much. Oh my gosh this is beautiful Clare and what a lovely gift!!! You sound like a lot of us, too many things going on. My show is a week from Saturday. I have my crates out of my studio onto the patio for loading. I bought a new crate to pack up the things I have made recently, my brain is going a mile a minute. Not only do I organize, run, and create things for the show but I am having all this dental work done too!!! Sigh..........time to take a rest, ha, ha. Hope Harry gets some new pants and bow tie, please tell Andy a big Happy Birthday, have a lovely visit/lunch with your Aunt I am sure your sister will understand. Take care, see you soon on here! Hi Clare, I hope you are managing to fit everything into your busy schedule !! I know exactly what you mean. This canvas is stunning, and so very apt !! 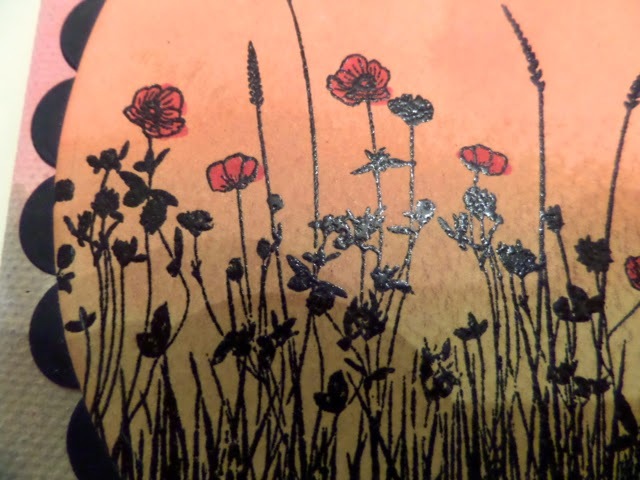 I'm especially loving the poppy, I really must get this die. Enjoy your time with your Sister and your Aunt. this is a wonderful canvas Clare.